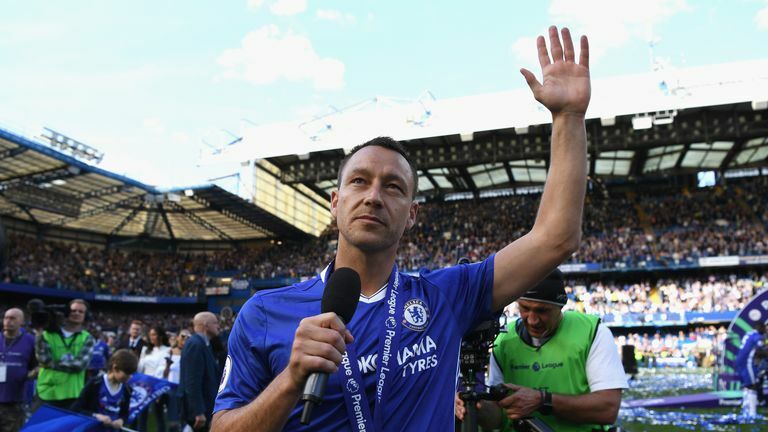 John Terry has reiterated his ambition to become a manager after Chelsea boss Maurizio Sarri expressed his willingness for the former captain to join his coaching staff. Terry is unlikely to be returning to Stamford Bridge, for now, but he is working with the academy players at Chelsea's Cobham training ground as he seeks his coaching qualifications, with a long-term target in mind. Speaking to The 5th Stand, Terry said: "Still undecided what I'm doing next. My end game is to be a manager and that's what I'm working towards with the younger boys here." Terry left Stamford Bridge after 22 years' service in June 2017. He made 717 appearances, 580 as captain and lifted 16 major trophies. He then joined Aston Villa on a one-year deal, leaving after they missed out on promotion to the Premier League. Terry enjoyed his first summer break since childhood, but trained on a daily basis. Terry, who turns 38 in December, said: "Good seven weeks with the family, which is the first time in 22 years. Some real quality time. Speaking ahead of Saturday's clash with Cardiff, Sarri said he was open to the prospect of Terry returning to the club. The Italian said: "I am very open with him, because he's the history of the club. He has won everything with the club, so it's up to him. "If he wants to play for another season I think it's right he tries to play. "If he wants to help us, I'm very, very happy."